You may have thought my travels were limited solely to Asia, well it’s time to think again. Join me on my next series of blogs through Cancun, Mexico. Although we were only there for a few days, we got into plenty of trouble! With that much tequila around, how could you not? 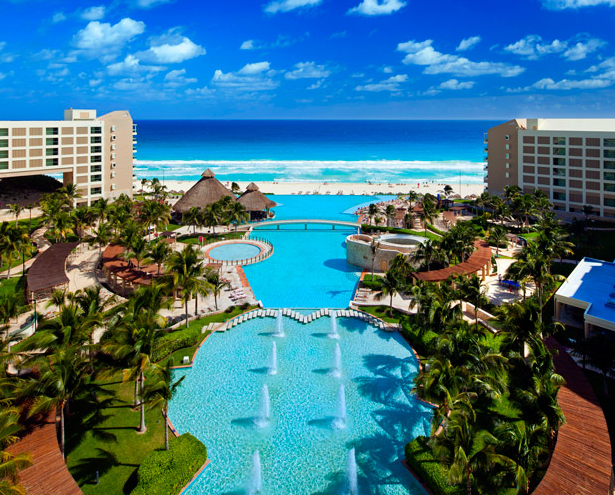 What could be better to escape the sweltering heat of summer in Atlanta, GA than with a trip even closer to the equator in Cancun, Mexico? At the time, my boyfriend Sean and I had been dating for about six months when he invited me to go on an annual summer trip to Cancun with a few of his close friends. The tradition had started a few years ago, he’d gone the year prior and had fun, and when he asked, I was happy to accept. I was (and still am) head over heels for him, so a vacation together couldn’t have been a more exciting proposition. That’s how n August six of us geared up for fun, sun and tequila on the Mexican Riviera. Woo! Five days of good times, sun burns and lots and lots of alcohol awaited. Yep, this is the awesome hotel we stayed at. I highly, highly recommend it. For my first trip south of the border it was fantastic and started out in the best of style. Apart from our flight departing prior to noon (something which two friends were unaccustomed to and decidedly unhappy about), Hartsfield Jackson Airport was a breeze on the Thursday morning we departed. No lines, no hoards of people and a perfect amount of chill-time in the Delta Skymiles Club instead of the gate. A big thank you to our Delta Platinum members. AIrport traveling is so much more civilized that way. Once we arrived in Cancun and exited the terminal, the wall of humidity hit me like a ton of bricks. I hadn’t seen humidity like that since Naples, FL. Suddenly, moisturizer of any kind seemed like overkill. Two of our friends living in Cancun, Jeremy and Lydia, were kind enough to chauffeur us to our hotel, the stunning Westin Lagunamar, right in the heart of the ‘hotel zone’ in Cancun, and from there the fun began. The Westin Lagunamar is truly in the middle of the stretch of beach that makes up Cancun’s famous oceanfront hotel properties. It’s within walking distance of multiple restaurants and shopping areas, and a short cab ride from marinas where boats can be procured and clubs (yes, even that tourist trap Senor Frog’s) can be accessed. The swim up bar at the main pool at the Westin. The hotel property itself is gorgeous: multiple pools, cabanas, a swim-up bar at the main pool, multiple restaurants at the hotel to choose from (including a fantastic breakfast buffet) and a very courteous, helpful concierge staff. Everyone was very gracious for the whole stay, and the rooms we had were perfect. My boyfriend and I had a standard room, but even that consisted of a massive bathroom with a full shower and whirlpool tub (the coolest part, was that from the tub you could slide open a wooden shutter and see out the windows of the room to the ocean), a small sitting area and a mini fridge perfect for keeping drinks and other snacks cold. I was impressed. Right after checking in, everyone was starving so we all headed across the street to the giant outdoor mall La Isla Cancun, settled in at the restaurant Blu (it was offering 2 for 1 drink specials) and commenced to ordering margaritas and guacamole post-haste. During our late afternoon lunch we witnessed a tourist trying out a water jetpack that, when operated by a pro could propel the wearer up to 15 ft in the air. Sadly, our victim lacked this level of mastery and only succeeded in boosting himself up to about 10 feet above the water, thereafter quickly losing control and plummeting back into the water headfirst. Entertaining for us, quite painful and possibly life-threatening for him. The water propelled jet pack. This was the pro showing off, not the guy who totally ate it. That night, Jeremy, his wife Lucia and Lydia took us for an ‘authentic’ (ie non-hotel zone) meal in Cancun at a relaxed, outdoor restaurant called Las de Guantanos. After the first 40 oz. Styrofoam cup of “flavored beer” was set down in front of Soo, everyone knew we were in good hands for the evening. During the course of the night, I had some of the best tacos I’ve ever tasted, and tequila shots were downed with abandon (many, many shots). To supplement the entertainment provided by the talented band playing that evening, Adam managed to get jalapeno juice in his eye, which sent him running for the bathroom tap to flush it out. It only resembled pink eye for a few hours after the incident. Two additional new friends also joined us that night, John and his wife Jackie, who had just moved to Cancun from Colorado. The eye pain was quickly forgotten when a local came around selling single roses and offered them to our group. A small rose-buying war ensued between Adam and John for their wives – apparently whoever could buy the most loved his wife more. I don’t remember who won, but I know both wives were most loved by the end of the night: each lady had practically a full bouquet when we left. In short, it was a perfect way to start our vacation in Cancun. Stay tuned for the next blog of our adventures in Cancun. How about swimming with sharks large enough to swallow you whole! The whole crew at dinner. At this point, sight had been regained in all eyes and the ‘rose incident’ had passed. 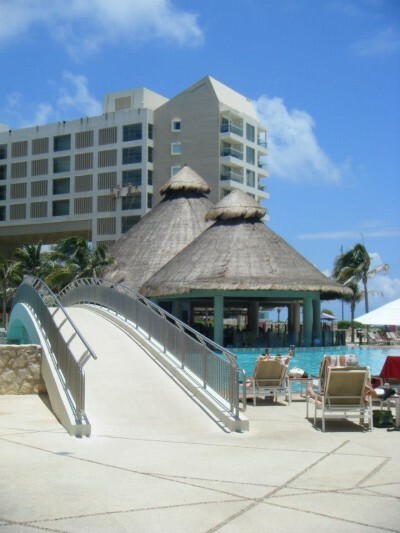 This entry was posted in Mexico, North America and tagged Cancun, Jalapeno, Margaritas, Mexico, North America, Tequila, Travels, Westin Lagunamar on May 26, 2014 by Paige N..